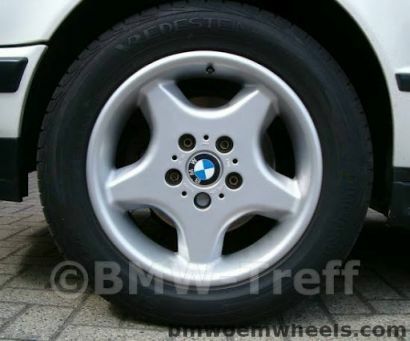 This Factory OEM BMW rim comes equipped on a E34, E36, Z3 and E39 models. The BMW style number for this wheel is bmw style 16. This is an aluminum wheel with a diameter of 16" and a width of 7". This wheels has 5 lug holes and a bolt pattern of 120mm. The offset of this BMW 325is rim is 46mm. The corresponding OEM part number for this rim is BMW part number(s): 36111092528. Original wheels name Flat Star.